Preserving peel in syrup is a very similar process to candying, except that it is done over a few days, and in the end, the peel isn’t necessarily dried.When you store the peel in syrup, it lasts longer. You can, however, take the peel out of the syrup and let it drip dry for a day or two. 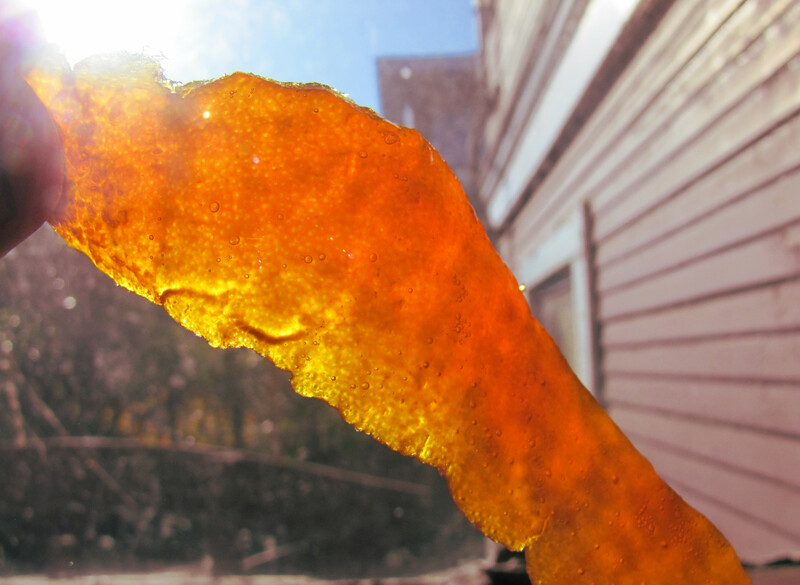 This will produce an excellent candied beel that you can dust with sugar, or dip in chocolate like any other candied peel. This recipe works for almost any citrus peel, or other fruit, in pretty much the same way. But because bitter orange peel is (as the name suggests) very bitter, more effort is spent in removing the unpleasant taste. The whole process takes several days, but requires very little work. This recipe is modified from that in “Food of Life”, by Najmieh Batmangliej — a Persian cookbook we can’t recmmend highly enough. One thing we do differently is to retain most of the white pith. 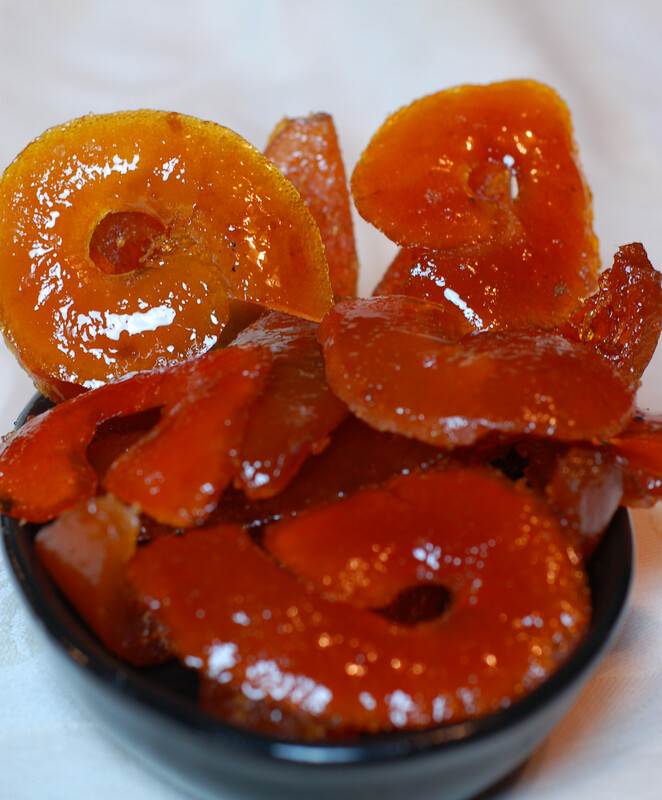 When preserving or candying peel, we’ve found that the pith takes on a nice, gummy texture. 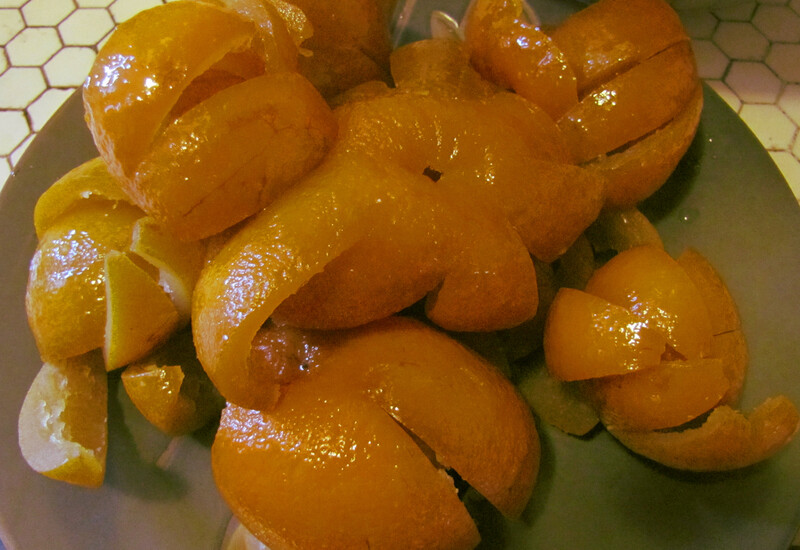 Slice the peel off the oranges in either strips or wedges, retaining some, or all, of the thick white pith. Weigh the peel, and record the weight for measuring out the sugar. Submerge the peel in water (put a plate on top, to weigh it down). Change the water the next day (taste it, it will be bitter), and at least one more time. You can taste the water to gauge how much bitterness there is left in the peel. Finally, boil the peels for fifteen minutes in clean water,and discard the water. If you are using peels other than bitter orange (and depending on you aversion to bitter), you can probably skip all the soaking, and go right to the final blanching step. Add sugar to the to the orange peels, and leave it to sit overnight. The next day, heat the peel, sugar, juice, and cloves or cardamom (if using) together at low heat. Once all the sugar has melted, simmer for 15 minutes. Cover (again making sure the peel is submerged) and let it sit overnight. 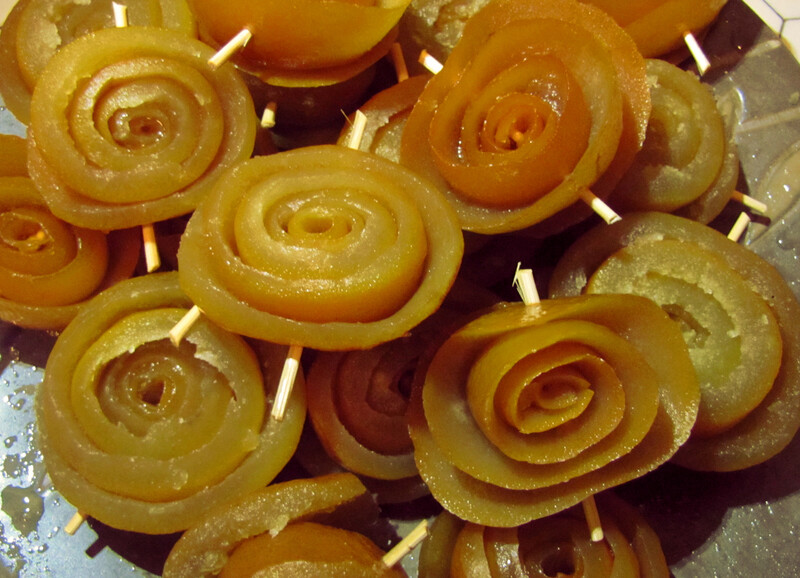 If you like, you can use toothpicks or skewers to tack strips of peel together into rosettes so they pack more easily. The next day, remove the peel from the syrup. Over low heat, reduce the syrup to half the volume. Return the peel to the syrup, and simmer for an additional fifteen minutes. It should be very clear, and tender-chewy. You can now bottle it, covered in syrup in sterilised containers, keep it in the fridge, or put them on a tray to drip dry.